This photo album shows the Cadets training during their weekly meetings. This is a picture of the roof simulator built by Adult Advisor McKay for the Cadets' ventilation training. 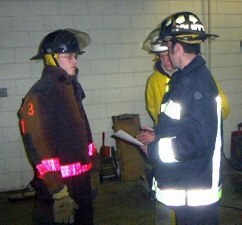 Left: Advisor Fondaw instructs Cadet Cook on the use of a Positive Pressure Ventilation Fan. 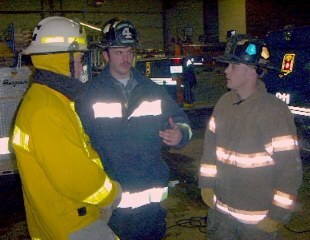 Right: Cadet Chief Flint listens as Firefighter Schoenstein and Advisor McKay discuss ventilation. 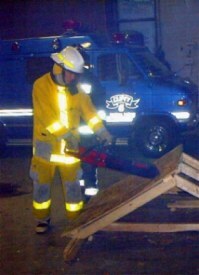 Left: Cadet Chief Flint uses a chain saw on the roof simulator. Right: Cadet Cook uses an axe on the simulator. 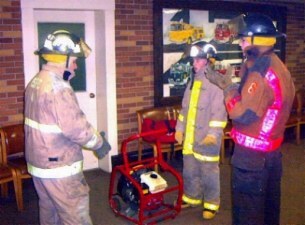 Left: Cadet Pritchard and Cadet Chief Flint receive instructions on the operation of the chainsaw from Firefighter Schoenstein. Right: Advisor Fondaw instructs Asst. 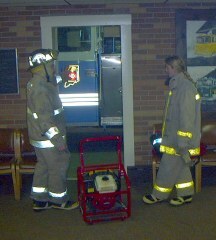 Cadet Chief Macon and Cadet Pritchard on the use of the PPV fan. 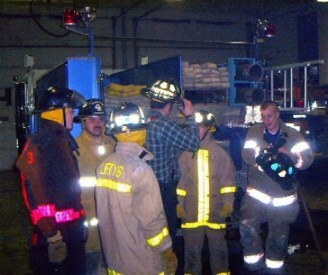 Cadets, Advisors and Firefighters take a break behind Engine Six. Left: Asst. 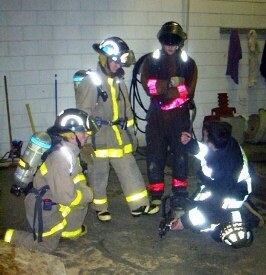 Cadet Chief Macon, Cadets Cook and Pritchard are instructed on the chainsaw by Firefighter Schoenstein. Right: Asst. 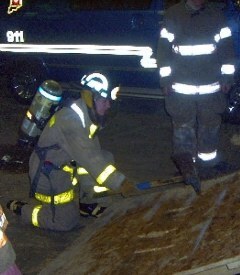 Cadet Chief Macon starts the PPV fan. Streams class. 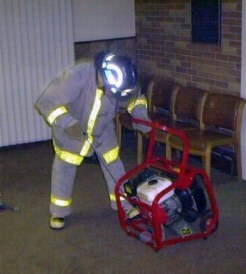 Left: Cadet Engineer Watterson and Cadet Cook operate a hoseline. 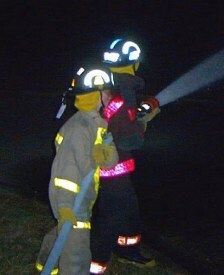 Right: Cadet Hoffman operates a "smooth bore" nozzle with the help of Firefighters Knox & Schoenstein. 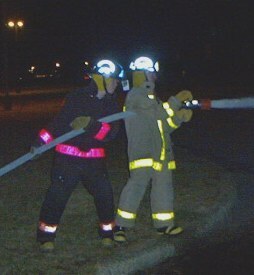 Left: Cadet Watterson operates the smooth bore by himself. 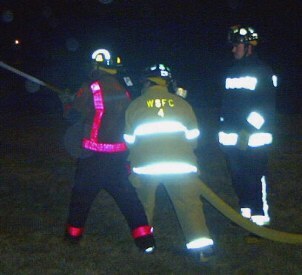 Right: Cadets Watterson and Macon operate a hoseline. 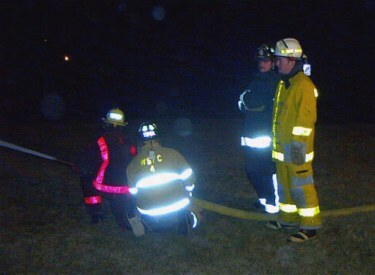 Cadet Hoffman operates a smooth bore nozzle, assisted by Firefighter Knox as Firefighter Schoenstein and Cadet Chief Flint look on.